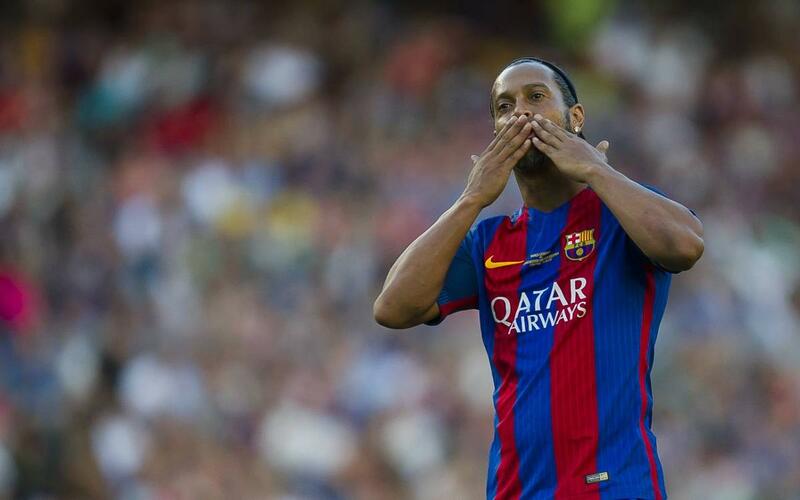 Ronaldinho was one of the star attractions at the Camp Nou on Friday night as the Barça and Manchester United legends produced a treat for the fans. The result may not have been the one the 50,000 or so home supporters wanted, the Red Devils winning 3-1, but the culés were nevertheless treated to several reminders of the kind of football they enjoyed in the pre-trident era – while for younger fans it was the chance to see players like Kluivert, Rivaldo, Popescu and Julio Salinas for the first time. But although United won the game, Ronaldinho stole the show, with his usual repertoire of passes without even looking, bending free-kicks, cheeky backheels and impossible looking dribbling skills. The moment he nutmegged Jesper Blomqvist had the stadium gushing with admiration – but that’s just one of the highlights that we’ve picked out in this tremendous little video of the worthy winner of last night’s MVP award.